This past Saturday my fabulous friend Leslie surprised me with a feature about me and my work on her lovely blog Chickaboom! I was so flattered! I've been following Leslie's blog for quite some time now and I always look forward to her posts. Leslie is a wonderful mom, talentedillustratorandcrafter, eco-conscious consumer, chocolate lover and more! 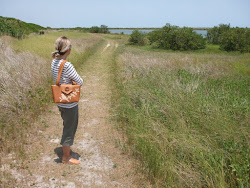 Her blog is filled with lots of fun stories, creative adventures, cool finds, great tips.....well, I could go on and on! She has been so supportive of me and my work. Her comments on my blog inspire me to keep creating and always put a smile on my face. Thank you Leslie! Wishing you and your family much peace, health and joy in the New Year! Wishing everyone Happy Holidays and much peace, health and joy in the New Year! I'll have a batch of Semi-Circle Purses made from Harris Tweed plaid available in the Pesky Cat Designs shop tomorrow afternoon. I had work this weekend that took me away from the studio but I still managed to sew up a few purses. This morning, 7:30 AM to be exact, I was on a NYC bus headed uptown along 1st Ave. About halfway to my destination the bus broke down right by the United Nations building. Instead of waiting for the next bus to arrive I decided to hop off and walk. I ended up walking one mile up 1st Ave. through the snow. I had my camera with me so I took a pic of my stranded bus from a distance. I ended up walking to my destination without any buses coming my way. I guess it turned out to be a good decision to plod through the snow! In the next hour or so I'll be adding a small batch of new purses to the Pesky Cat Designs shop. The purse posted above is made from Harris Tweed wool, my favorite textile at the moment. Yesterday I sold the last purse in the shop made from the brown/mustard plaid and only have a small amount of fabric left over in the red/green and blue/green plaid. When I ordered my fabric from Scotland I was not sure if my customers would be interested in this cloth. Well, it has turned out to be one of my best sellers this season. I would have ordered more yardage if I knew ahead of time. But I guess that's the nature of the business. You never know what will be popular until you put it to the test! I've been busy in the Pesky Cat Designs studio and my normally neatly arranged spools of thread are now in a state of disarray.Balance, my mini art feeling from Artmind pictured above, was reminding me to slow down and take a break. So today I decided to take a trip on the Long Island Rail Road and visit a friend for lunch. I had a wonderful time and just got home a couple of hours ago. I decided that today would be a studio-free day. Of course I can't stay away from the studio for too long so tomorrow I'll be back sewing up a storm to get my latest work in progress finished by Thursday. I'll also be adding a couple of new bags made from chenille in robin's egg blue, to the shop late morning. Stay tuned! This morning I discovered my Semi-Circle Purse on Etsy's front page! This list of holiday gift ideas was curated by Etsy and features lots of cool items. I especially love Ellie the horse by Annika Easter created out of corduroy, one of my favorite textiles, and yarn. I think it would be a great gift for a horse lover of any age! By the way, I have anEquestrian Wayfarer Purse available in my shop now. The horse applique was inspired by a road trip that took me through the many horse farms located in Ocala, Florida last Spring. I would love to hear from my readers what their favorite applique design is from the Pesky Cat Designs shop or an applique design they would like to see in the shop. I really look forward to hear what you are inspired by! 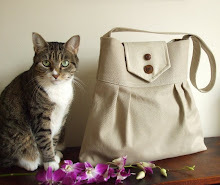 I'll be adding some new purses to the Pesky Cat Designs shop this afternoon. I should have them listed by 7PM. This weeks inspirations were seahorses, foliage and majestic horses. Next week expect to see birds and other nature inspired creations. I'm working hard to have lots of new items in the shop for the holiday gift buying season. If there is an applique design that you would like to see in the shop or particular color let me know. I would love to hear what you are inspired by! I added lots of new items to the Pesky Cat Designs shop this week. The purse shown above is created with a chenille fabric, a new textile that I recently added to the studio. It has a velvet feel and looks quite luxurious. I was really pleased with how the chenille in robin egg blue compliments the chocolate brown applique. Next week I plan to add more purses with seahorses, equestrian inspirations and more. Stay tuned! It's been quite busy in the Pesky Cat Designs studio this week. I am happy to say that a lot was accomplished. In the next hour or so I'll be adding new corduroy Wayfarer Purses to the shop. My newest batch of purses all have straps that are lined with the same pretty cotton print fabric as the interior of the purse. I'll also be adding more purses to the shop tomorrow so check back soon!